Slack Essentials is your guide to working in Slack. Previously, we covered how to organize your work into channels as well as how to read, write and respond to messages in Slack. Once you have a handle on these steps, you can use this formula to have organized, free-flowing conversations on any topic. Let’s assume your team is working on a new company website. The first thing you should do is create a dedicated project channel. Follow the basic steps below. This creates a single place for all conversations and updates for this project. It also ensures everyone in the channel is clear on why they were invited, what the kickoff documents look like, and next steps. 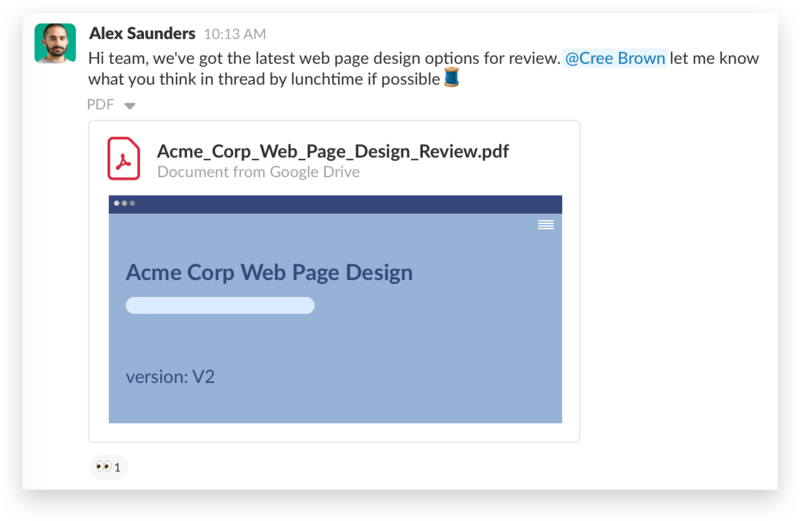 Slack makes it easy to share files, from documents and spreadsheets to images and videos. Let’s say you’re looking for feedback on a proposed timeline to kick the project off. 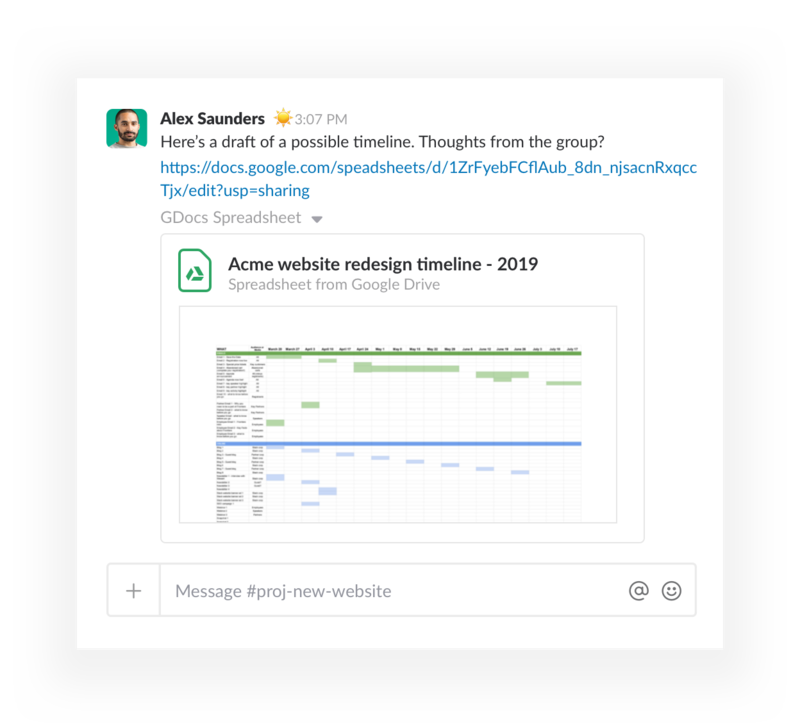 Slack apps allow you to bring your existing tools together, including cloud services such as Google Drive, OneDrive, Dropbox and Box. Visit the Slack App Directory to add the integration for the service you use. Once installed, you can search within Slack for titles and contents of shared files—including any updates you make later. With Google Drive, a bot will instantly check if everyone in the channel can access a file you share. If not, you can update the permissions right inside Slack. Use an @mention when you need feedback from a specific person. That way, they’ll get a push notification. Give people a deadline. If this feedback is holding up your work, mention that you need it by end of day or, if you have more time, later that week. Whichever it is, be specific. When you share a file that requires feedback from more than a few people, use threads to organize discussions and feedback. 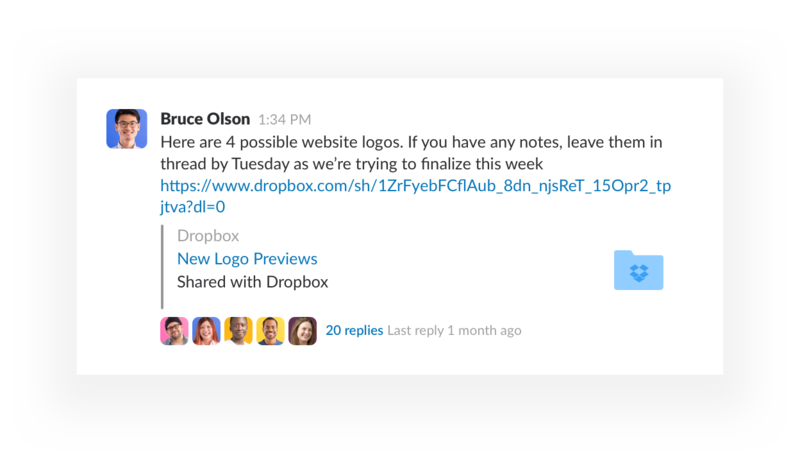 All of the context around suggestions, changes and approvals will remain with those files in Slack threads. Not all feedback requires lengthy discussion threads among many people. 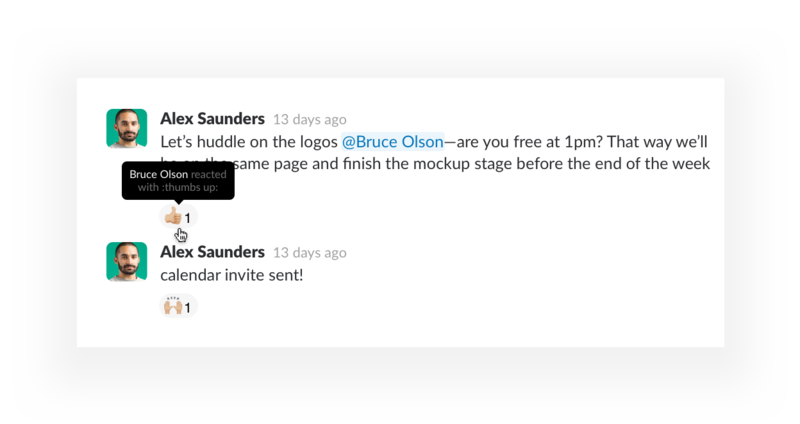 Emoji can be fun, but in Slack they’re also incredibly quick and informative when collecting input and approvals. Emoji reactions also help you keep channel conversations tidy by consolidating the otherwise one-word responses from your whole team. Reply in channel with any final decisions made deep in a discussion thread using the “Also send to channel” checkbox. That way the whole team can see without having to dig through a discussion thread. Forward relevant messages by copying the link to the message and pasting it into a message or thread. When a boss or key person asks you for an update over a direct message, share links to any relevant messages from the project channel. Don’t bottle decisions in DMs. If a direct message discussion leads to a change in your project, repost those decisions in channel so the whole team can be in the loop. Once you’ve gathered feedback from your team and implemented changes, repeat this process until the project is complete. Remember to share the final version in channel, so it’s easy for your entire team to reference later. In all, using best practices to give and receive feedback—and acting on it—is both an inclusive experience for your colleagues as they see their suggestions incorporated into final versions, and inspires trust that your project is on the right track. Even better, when all your project work is conducted in channels, it’s easy for anyone on your team—new or old—to find all the relevant files, discussions and decisions—even far into the future. Learn how threads, emoji and more can help you collect feedback on slides, mockups, your codebase and more.